A lot of tour websites are filled with gushing testimonials, and you might well doubt the truth of some of them. 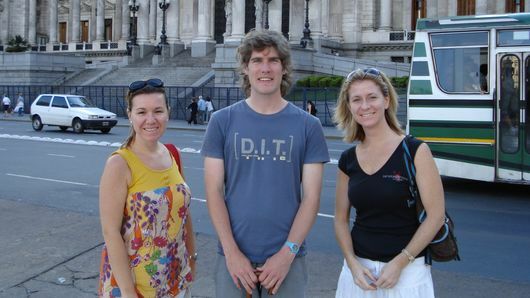 But we can assure you that all of the client testimonials listed on this page are from real people who have taken our private walking tours of Buenos Aires, and stand by what they wrote about them. If you would like further reassurance, please feel free to contact us to ask for some referrals from our delighted past clients. A wonderful tour guide, who provided a great introduction to Buenos Aires during a full-day walking tour. The combination of taxi, public bus, and walking allowed us to see and learn about the most important sites in a short period of time, and Jessica was very sensitive to making sure we were comfortable and well-hydrated during what was a very hot day. We were in Buenos Aires for a week and took the tour soon after arrival, which gave us a great idea of what we’d like to explore when we had additional time. However, I think that this full-day tour would be fabulous even for those who have only one day to spend in Buenos Aires to get a great overview of the city and its history. Ok, so maybe more tango than twist. Our three+ hour private walking tour with Oliver through la Republica de Boca and the San Telmo neighborhoods was a terrifically interesting and informative introduction to two neighborhoods. BuenosTours was quickly responsive to our query and their follow-up demonstrated their willingness to tailor the tour to our interests and pace. Oliver provided locally specific information as well as a wider city perspective. We have to say that anyone’s first lesson in ‘Buenos Aires Appreciation’ must be with Ceri. He delivered a stellar experience. He connected with us and us with him. He insures that he knows his audience (us) right away and he certainly knows his subject (the city) and how to articulate it vividly. “We booked with BuenosTours after reading a recommendation online in the Guardian. Getting in touch was easy and the booking experience both simple and intuitive. Excitedly we embarked with our guide, Ceri, and had a most wonderful, unique, and really ‘insider’s point of view’ visit to La Boca and San Telmo. Though I had been to BA several times on my own on business, there is no way I could have created such a superb and personal visit. “I felt like I was walking around with a friend and I couldn’t have had a better tour guide. Jessica has a very easy going personality which made the day flew by. Jessica was able to help me get on the subway back to my hotel all on my own and wrote great directions. For someone who gets lost a lot, once I was able to learn the subway system, I went back to some of the places I visited with Jessica on my own. “We were extremely pleased with everything about the tour. Oliver was outstanding, very knowledgeable, and we learned and saw so much. The pace was perfect, the itinerary was well thought out, the sites were exciting to see, and the café and restaurant were welcome stops. Oliver made the tour enjoyable and educational, and we highly recommend Buenos Tours and our guide, Oliver. “What a great time we had with Oliver and Jessica, exploring the most historic and most beautiful neighborhoods in Buenos Aires. Both of our guides were pleasant and knowledgeable and our itinerary well planned. “I had booked the tour for myself & my wife but she had to cancel at the very last minute. Without me asking, Alan offered a full refund of her cost, which shows that this organization is all about making your trip to BA a memorable experience. 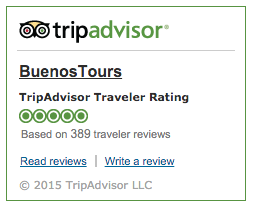 “Our day with Buenos Tours more than met our expectations. Jessica took us to places that tourists never see and we also viewed all the main tourist attractions. We enjoyed a delicious lunch in a charming restaurant filled with local folks. We learned about Argentine history and culture and enjoyed walking through many different neighborhoods, some totally upscale and some not so much, but each one fascinating. Don’t miss the opportunity to experience the true Buenos Aires with Jessica”. “By far this 7 hour walking tour was the best way to see and learn about Buenos Aires. Jessica is an amazing guide. Full of knowledge and charm. She took us places that we would of never went by ourselves. We had a conversation with other passengers from our cruise, that took an excursion offered by cruise line and were told that it was a terrible choice. WE on other hand had a great fun time”. “Enough good things cannot be said about BuenosTours. The tour guide was knowledgeable, friendly, professional, on-time, and very much on-point. The cost was incredibly reasonable, the sights were perfect, and it was the best way for my small group to feel comfortable in the city right off the bat. Our 7-hour tour seemed to pass very quickly because we were all having so much fun, learning a lot, and being so engaged by our tour guide. “I met Jessica this morning and was treated to an amazing tour of Recoleta and the surrounding area. If you take one part Latin American encyclopedia, add one part character and personality, one part fascinating story telling, and equal parts charm, wit, humor, and beauty, then you end up with the talented Ms. Jessica. Please pass along my thanks to her and I will pass along my recommendations for Buenos Aires Walking Tours as *the* premiere tour group to fellow visitors to BA. “Alan and Melanie our tour guides were absolutely awesome. They went over and above their duties and we all loved what they showed us. I would and will strongly recommend them to anyone I know who plans on visiting their wonderful city of Buenos Aires in the future. Thank you. “Walking through the double doors at EZE, Na and I both looked at each other and said “bingo, there is Alan’s recommended cab service, lets go”. Lunch at El Establo was fun and we also stopped by some of your other recommended restaurants, could have done any of them. “We enjoyed your tour on Monday sooooo much. Thanks… wish we could have kept you with us for our whole time here. “Thank you so much for the great tour. I have attached a photo from our tour (see below). “I’ve been a tour guide myself and – to be honest – I am a little bit hyper-critical concerning guided tours, I hate ‘funny tours’ consisting of old jokes and rehashed clichés. However, I really can recommend the walking tour with BuenosTours. It’s a MUST if you are in Buenos Aires! 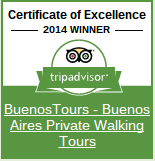 “We really enjoyed your walking tours and your company. It made the stay in BA so much more enjoyable. We learned a lot and were able to teach our friends in BA some of their own history. “This is the second year I’ve had tours with Alan. I highly recommend him. He is informative, polite, and has a passion for Argentinian history. You can tell he really loves his job. “My wife and I took the BuenosTours City Center Tour, which shows the most interesting and important sights in the City’s historical center. This three-hour tour (US Americans feel free to sing the Gilligan’s Island theme song if you so choose!) packs in a tremendous amount of history and anecdotes. We had a pleasant and interesting tour guide who gave a well-paced, fun, fact-filled easy walk. To break up the day, there was a refreshment break at Cafe Tortoni and a subway ride that includes a historically preserved turn-of-the-century station complete with wooden subway cars where the doors must be manually opened. “My BuenosTours guide gave me a very personal tour of the center of Buenos Aires, adding interesting little stories here and there so that the history of the city was actually very enjoyable to hear. For me, the best aspect of the tour was that I was able to ask my guide all the questions I wanted, not just about the sights on the tour, but also about other things to see and do in Buenos Aires. For example, my guide recommended that I went to the Faena Hotel for cocktails, and that was possibly the most enjoyable ‘out of this world’ experience I had while in Buenos Aires. All in all, an excellent tour, which easily kept my interest for the duration, and set me up for spending a great time here in Buenos Aires with a heap of useful advice. Want more testimonials to our great tours? Then check out our press and buzz page!